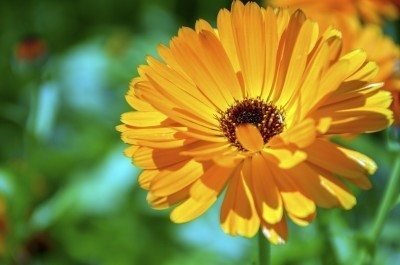 Bright yellow and orange flowers, historically used for medicinal and culinary purposes, result from easy calendula care when growing this simple flower. Commonly called the pot marigold (Calendula officinalis), the calendula flower has long been a staple in British cottage gardens. Petals of the calendula flower are used in cooking and were used as yellow coloring in cheeses and butters in centuries past. When used in stews, broths and salads, petals of the calendula flower add a spicy taste similar to saffron to many dishes. All parts of calendula plants are useful in many ways. The plant is said to stimulate the immune system and is currently used as an ingredient in many cosmetics. Flowers and leaves of the calendula may be dried and stored for later use. In the vegetable garden, calendula draws aphids away from valuable plants. 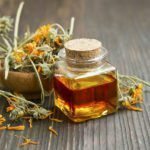 While uses of calendula plants are diverse, growing calendula in the flower or herb garden is an optimum use of this attractive plant. 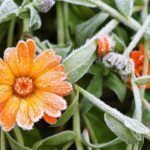 Calendula plants are frost tolerant and somewhat cold hardy and add long-lasting color and beauty in a flower bed or container. The calendula flower or flowering herb is an annual which will readily reseed. Too much calendula care can result in stunted or slow growth of calendula plants. Poor to average, well draining soil and only occasional watering after plants are established is the secret to growing prolific calendula plants. Like most herbs, calendulas are adaptable and do not require a lot of maintenance. Roots will often adapt to the space provided. The amazing pot marigold can be grown in containers or beds in full sun to shade conditions. As the calendula prefers cool temperatures, flowers last longer in filtered sun or shady areas. If deadheaded regularly, this plant can bloom from spring through fall and beyond. In warmer areas, the calendula may take a break from blooming during summer heat and then put on a show as temperatures fall in autumn. Regular pinching keeps the 1- to 3-foot plant bushy and prevents tall, spindly stalks.